I love browsing the recently finished projects in our Berroco Lovers forum. It’s fun to see which patterns others are making, but it’s also really interesting for me to see which yarns people favor for certain kinds of projects. 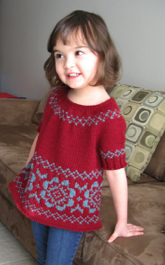 You never know what you’ll get in a mystery KAL, but raveler MaryKnits7 ended up with a beautiful raglan sweater for her daughter, Alisha. The top-down, seamless sweater features a small cable design, ribbed sleeves and a large front pocket. I love the bright berry shade of our Vintage DK that Mary chose for Alisha’s sweater, but a different color could also work for a boy. It can be hard to find cute crochet tops that are practical for everyday wear. But I was immediately attracted to the color and the intricate stitch pattern in raveler KarlyMac’s Emerald City top. It’s a beautiful design to start with, but I really like the modifications Karly made to the cowl neckline. She chose a wider rib, which I think makes the main stitch detail stand out more. She also decided to leave the back of the collar split so it would sit better. I’m not sure when I’ll find the time, but this top has already been added to my queue! There’s a funny story about this adorable sweater. Raveler Onoris intended to make it for her one-year-old daughter, but because she didn’t block her swatch before she cast on, it ended up being big enough to fit her three-year-old daughter! While the original design called for three complementary colors, I really like the contrast and simplicity of the two shades Onoris picked. She used the Crimson (5154) and Breezeway (5194) shades of our Vintage yarn. She plans to reverse the colors and make another one (hopefully a bit smaller this time) for her younger daughter. Can’t get enough of cables? This beautiful shawl-collared cardigan is covered in cables, which look even better knit in our Vintage yarn! Raveler Andreafromtoronto liked it so much, she made two – one for herself and one for her daughter! Whether you’re sitting in front of a fire or braving the cold, this sweater will definitely keep you warm. Gorgeous sweater! I love cable and this would be a definite possibility after I finish the Great American Aran Afghan.